CAD Digest, one of the most popular online sources for CAD, CAM & CAE articles, reviews the capabilities of the GRAITEC ADVANCE suite as a complete solution for structural design. The author of the review, Protim Banerjee (with 15 years of experience in construction management, structural engineering and AEC software development) provides an overview of the GRAITEC ADVANCE suite, highlighting the pros as well as the cons for compatibility and data exchange with Revit Structures 2012. GRAITEC ADVANCE and Revit Structures have been compatible since 2006, up to the present time. This integration has allowed engineers and design offices using software solutions from both suites to run their structure calculation and drawing creation quickly, without recreating the model and with a minimal risk of errors. As an Autodesk partner for over 10 years, GRAITEC offers an application for Revit Structures – GRAITEC BIM Connect – that ensures the compatibility of Revit models with the GRAITEC Advance suite and with industry standards, such as IFC and SDNF. With GRAITEC BIM Connect, data is imported and exported between applications, using GRAITEC’s own transfer file format – GTC files. The free Revit add-on is available for download here. This add-on generates GTC files for import into GRAITEC applications, and also works as a two-way transfer. “The Revit add-on allows model synchronization, a tool very useful for comparing the original model with updated ones. The changes that are alerted include member additions (appended), member modifications (modified), and member deletions (deleted); the alerts are made by color coding and by tabulating them in the synchronization dialog. You can review the changes, and then decide whether to accept them” Protim Banerjee states. GRAITEC BIM Connectt is, in fact, a concept which has constantly improved since 2009. Its key features include data synchronization with the GRAITEC ADVANCE Suite, IFC Interface (Import / Export), CIS/2 Interface (Import / Export), SDNF Interface (Import / Export), PSS Interface (Import / Export). The 3D model is imported from Autodesk Revit Structure (or Autodesk Revit Architecture) to the desired GRAITEC Structural Analysis or Detailing product. To complete the model, a structural analysis and design process is run to optimize the structure, and then synchronized with the Revit Structure model to include any modifications. The implemented elements are structural elements (columns, beams, wall, slabs), custom families containing an analytical model, supports and loads. 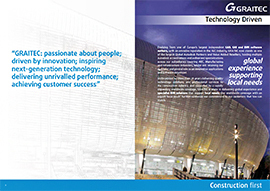 “GRAITEC has carefully conceived the overall BIM process with the use of its GTC file format. The concept of cross section mapping and synchronization of changes is certainly very innovative. GRAITEC scores good points when it comes to the software design”, Protim Banerjee concludes, stating also that the GRAITEC ADVANCE suite covers all aspects of structural BIM workflow.